This lesson will let the children enjoy some pie. First, however, they have to calculate how many slices are needed to feed everyone in class and how many pies it will take to get that number of pieces. The children will color their paper plate wedge to show whether they would rather have an apple pie or a pumpkin pie. Make sure the students print their names on the back of their slices. Note: the plates dry rather quickly. The pie slices will be dried by the time the lesson is taught. See the photo for the example. The pie wedges will be counted and tallied to show whether more students prefer apple or pumpkin pie. There is another lesson on Bright Hub Education that explains how to integrate this into a lesson about voting. After you have tallied the wedges, review fractions with the students. You can use a fraction book for this purpose. After reading the book, say to the students, "Today we are going to figure out how many pies (apple or pumpkin) that I need to purchase so that each student can have a slice of pie." Give some examples from the book. 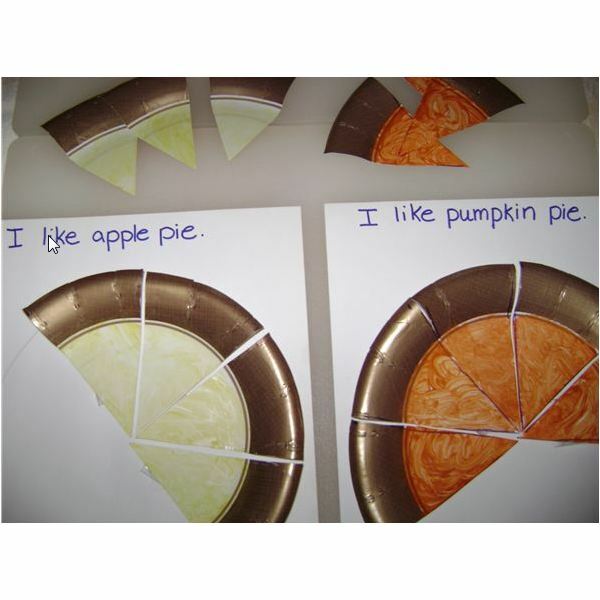 Show the students a pie pattern (from the download in the Materials list) and ask how many slices of pie that there are in the whole pie (kids-sized pieces will be about 8 slices per pie). Tell the students that a fraction means part of a whole. Chart the definition. Ask the students to tell you how many slices would be left if you ate one (color one slice in). For example, teach the students that 1/8 of the pie has been eaten. Work your way up to 4/8 or 1/2 of the pie. Next, pass out the apple or pumpkin pies that they made on paper plates. Tell them that they are going to tape their "slice" of pie piece onto the circle (see photo above). In the end you have a simple way that they can see how many pies will need to be purchased for each student to have one slice to eat. Count the number of slices that the class will eat and then count the number of pies that the teacher will purchase. Chances are you will have a remainder, so discuss remainder. After the lesson, make this into a center game or work for small group instruction for twice the fun. Assessment may come later after several fraction lessons. 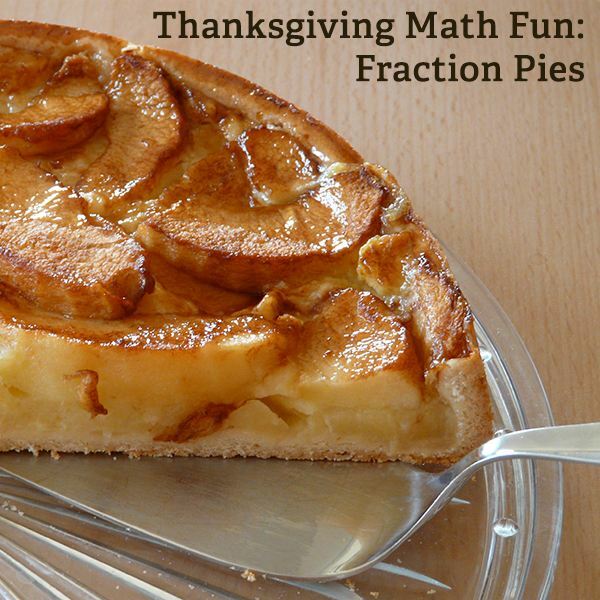 Take a few pieces of pie away and ask the student the fraction of pie that is left. Purchase the pies and bring them to class tomorrow! Happy Thanksgiving!